Flamingos are wading birds. There are only four species of flamingos in the Americas and two in the old world. Feeding, anatomy, habitat, distribution, reproduction, predators and all the information about flamingos. There are only six known species of flamingos in the world. Four in the American continent and two in the old world. There are many volunteers out there that work to get injured Flamingos the help that they need. predators and flamingo social structure and more. 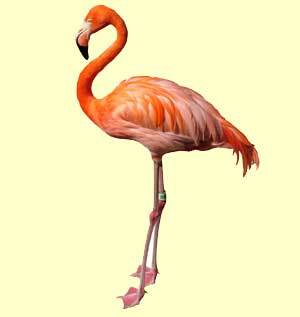 The coloring for a Flamingo ranges from various shapes of pink all the way to a crimson red. Some of them are shades of orange too. They also have colors of cream and white mixed in. They are lovely creatures and they seem to be very calm. If you have a local zoo then chances are you have been able to see and to observe these animals up close. Flamingos live in a variety of habitat locations. They are fine in both warm and cold areas. They live in both the mountain areas and the flat lands. However, they do need plenty of access to food and to water. They are found in lakes, lagoons, and even swamps all over. As long as there are small insects, crustaceans, and algae they seem to have the food sources that they need. These animals are very social and they thrive on interaction with each other. Colonies of Flamingos in the wild can be thousands in number. Many of them are small though with only about 50 in them. The largest group of Flamingos is found in East Africa where a single colony has more than 1 million members. They engage in a variety of behaviors that are fascinating to watch. Flamingos offspring born white or light gray. As they consume their food, the color appears. One thing that researchers have learned by placing Flamingos in captivity is that they don’t do well if there aren’t plenty of other members around. This is why a zoo has from 15 to 25 of them to display. During mating, the Flamingos will pair up and they stay with each other after mating to create the nest for the egg. Then also work as a team to keep the egg warm and safe for about 30 days until it hatches. Young Flamingos are fed crop milk that the parents both produce instead of regurgitated foods as other birds provide for their young. Many people don’t realize how much Flamingos fly or their abilities. They can take off rapidly and fly up to 35 miles per hour. They can also fly hundreds of miles a day between different locations in order to find adequate amounts of food for them to survive on. Most of this flight time takes place at night though which is why many of us never see them. Flamingos tend to live a long life in the wild though with an average of 25 to 30 years. In captivity some of them have lived up to 40 years. They aren’t really in danger of extinction at this time but some conservation efforts are in place. This is based on research that shows introduction of bacteria into the water has killed of large numbers of them in certain areas. It is also based on research that shows how global warming has prevented sufficient rain in some areas to keep these animals engaging in the mating process. With such problems identified now there are many groups out there working to educate the public and to help ensure these animals don’t end up on the list of endangered species. You can learn about such efforts and become part of their cause by looking around online.